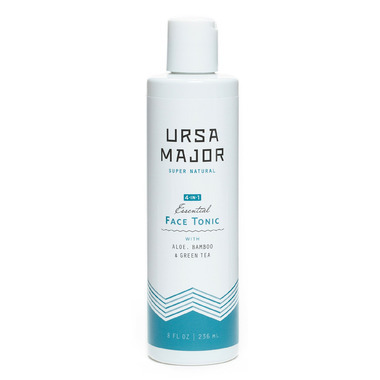 The Ursa Major 4-in-1 Essential Face Tonic is a refreshing cure-all everyone should own. Use it after my cleanser as a Toner but doesn't really do amazing effect, not bad either. Don't know if I would purchase it again or not but it definitely is not a 4-in-1 as advertised.. I was happy to see that Well.ca carried Ursa Major products: it's probably the easiest way to get this line in Canada if, like me, you're not near a store that carries it. While this is the first time I bought the tonic from Well.ca, I have been using it everyday as a toner for my sensitive/normal to dry skin for several months now, and I really notice a difference. My friends comment on how nice my skin looks. I can't say I notice, so I'll have to take their word for it. What I really notice, however, is, first, after shaving: I have a really coarse beard, and the tonic really helps to alleviate the irritation to my sensitive, and in-grown hairs have actually stopped altogether, likely due to the tonic's exfoliating property. Second, the tonic just really soothes and tones my skin in general, likely because the first ingredient is aloe juice, not just water: my face is markedly happier after using the tonic. The scent is also great, a really nice herbal aroma. Effective but drying, so I don't use it every day.